Life, as they say, is a journey. So is learning. As always one to think ahead, plan ahead, I'm beginning to think beyond the current crop of deadlines. Craft fair/vendor hall for the Hospital Auxilliary conference in April. It won't be very busy most of the time so I'm thinking of what I can bring to work on/demo during the slow times. May 6-10, level two in Tenino, WA. One of the benefits of taking the Olds College program is that students are not confined to one campus. You can take level one at Olds, for example, then move to another location for level two. June will be pretty much taken up with conference. Our guild has the stairwell at the public library for the month, so we can set up our display before the conference begins and take it down after the conference ends. During the conference I will be wearing way too many hats, but that's pretty much standard. Doug will man my booth in the vendor hall while I deal with conference stuff including presenting seminars and so on. Still waiting to hear about Fibre Week at Olds College and if I will get to teach, but I'm holding the dates, just in case. August 6-10 I'm booked to teach level two at Yadkinville, NC and 12-16 level one. September I'm scheduled to do The Efficient Weaver at the John C Campbell Folk School. I have no idea if anyone has registered for this class yet - I think, like the Olds classes, I need 8 to make it 'go'. Today when I walked into the school to spend a couple of hours with a class of teenagers, I heard songbirds singing. It is nearly the end of February, we are still having cold temperatures and snow lies thick on the ground. But birds were singing. I looked around to see if I could spot them - their voices were so loud I felt surely they must be very near by - but in the brilliant sunshine, they must have been hiding in a protected shadow of the building. It made me smile to hear such a delightful harbinger of spring. I don't know how many kids tried out weaving a bit of 'tapestry' on the cardboard I supplied. They came and went as their interest waxed and waned. A few had completed small bits of cloth by the end of the two hours, so I was able to show them how to finish their weaving off. The teacher had a button and bead box and one added a button to her strip of cloth to turn it into a bracelet. A couple of the students seemed interested in doing more on the floor loom so the teacher and I talked about giving the kids time to think about what they did, maybe finish their little cardboard loom weaving, maybe try the floor loom (one of the students says she remembers what to do so she has been designated 'teacher' for any others! ), then maybe come back again to help those who want to learn more in a few weeks. The past couple of days have been more about planting seeds than harvesting a crop. Weaving cloth takes time. Sometimes a student knows immediately they want to explore further. Sometimes it takes a while. If nothing else, those who tried it have an appreciation for what is involved. And today I heard the songbirds singing. As I was scrolling through Facebook this afternoon, a headline caught my eye "How much love you put in the doing". Intrigued, I read it and thoughts bubbled up - as they do. First of all, I spent the morning talking to a group of high school students about weaving. I found it a real challenge because I didn't have a point of instant connection with them, like I do with weaving guild members. I had to find a way to connect them with my story, my passion, my love of textiles. With a 40+ year gap between us, I have no idea if any of them were the least bit intrigued, or stirred. If nothing else, I might have planted a seed. But that is impossible to judge. After spending that time this morning and reading the headline and short article, plus a few other things going on in my life right at this minute, I started to think about my 40+ years of twiddling with string. And just how much love there has been. Oh it hasn't always been a bed of roses (and if it was, someone forgot to strip the thorns). There have been the usual ups and downs, road closures and detours. Successes and failures. There have been things I have worked hard to achieve. There have been great gifts that were completely unexpected. When I think about my life it is a tangled mess in so many ways. To try and find an end to that tangle seems impossible - even if I could, would I really want to? I keep dancing around the concept of 'retirement'. Every time I think I have a plan, something happens to upend my expectations of what direction my life is going to go. This isn't new - it's the way my life has gone. I rather suspect it is the way most people's lives go. A while ago I was asked to talk about being a professional/production weaver. By that point in my career/life there had been a number of changes in direction, but I'd always managed to find a route that kept me at the loom. At the end of the presentation, one of the attendees came to talk to me and she mentioned that she admired how I had managed to stay on course, to re-imagine my life within weaving. While she had totally and completely changed direction, changed careers three times, I had re-imagined myself as a weaver. I think she found that puzzling, but also somehow inspiring. At least, that was the message I got from the way she framed her observations. That first time I sat at a floor loom, shuttle in hand, I knew I had come 'home'. Wanting to maintain that sense of 'home', I just kept trying different things. Weaving different things. Just kept on, keeping on. 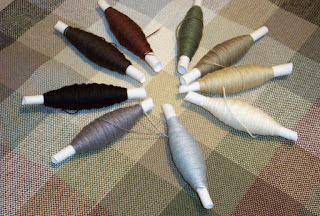 Someone on a weaving group asked recently how to keep two yarns from tangling when winding a warp. Here's my two cents (partly because I can't remember which group). I prefer to wind from tubes or cones. I have little posts I can stand the tubes on. My tubes are always set up to unwind counter clockwise. I don't remember why. I think I determined that 2/8 cotton set up to unwind this way would remove a twist per rotation. It seemed preferable to me to remove a twist rather than add one, but it's all lost in the mists of time. Let's just say I always do it this way. Which ever way it is done, they need to both be winding off in the same direction. If one winds one way, the other the other direction, the yarn coming off will snag onto the opposite yarn and tangle. If they are winding off the same direction, they snag less. The larger the cone or tube, the further apart they need to be. For these half pound tubes from Brassard, a couple of inches apart seems to be fine. Larger cones will be set further apart due to the size of the 'balloon' as the yarn whips around the yarn package as it comes off. The further apart the packages, the less inclined the yarns will be to tangle. The yarns are run through a dent in the reed laid flat at the bottom of the board. This keeps the yarn feeding off the package straight, again reducing tangles, but also keep the packages upright, not tipping over and wrapping themselves around my ankles. This is especially helpful when I'm winding several different coloured stripes - there is enough room below the board for a number of yarn packages. I simply drop the yarns I'm not using and pick up the ones that are next in the sequence. During winding I keep a finger in between the two yarns. Lots of people say they don't bother and it's not a problem. For me it was, so I do. 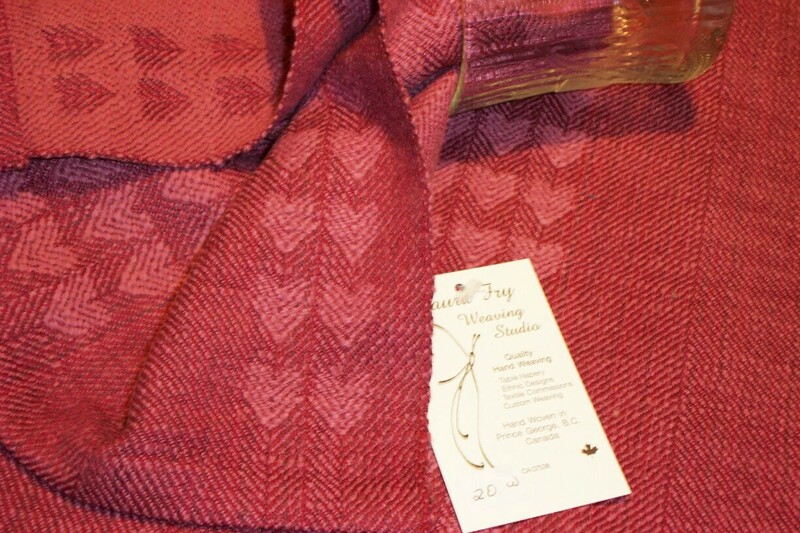 My initial interest in weaving was in making cloth for clothing. 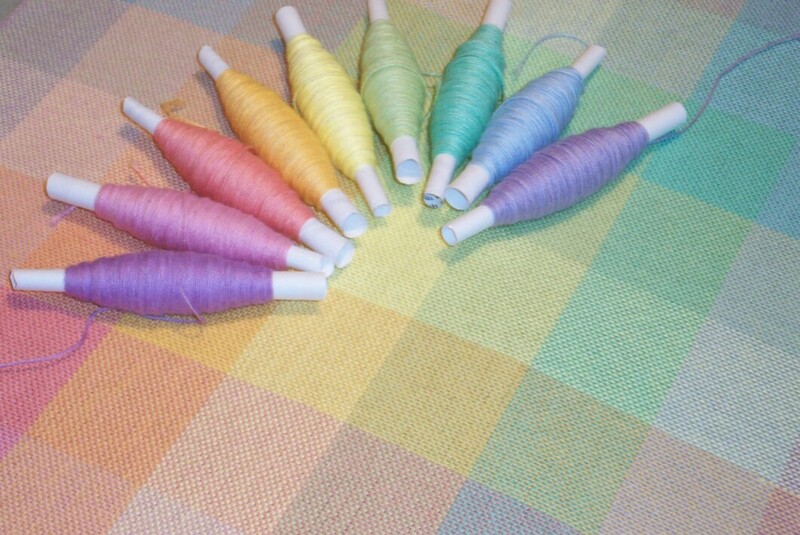 I wove a lot with 2/60 silk. 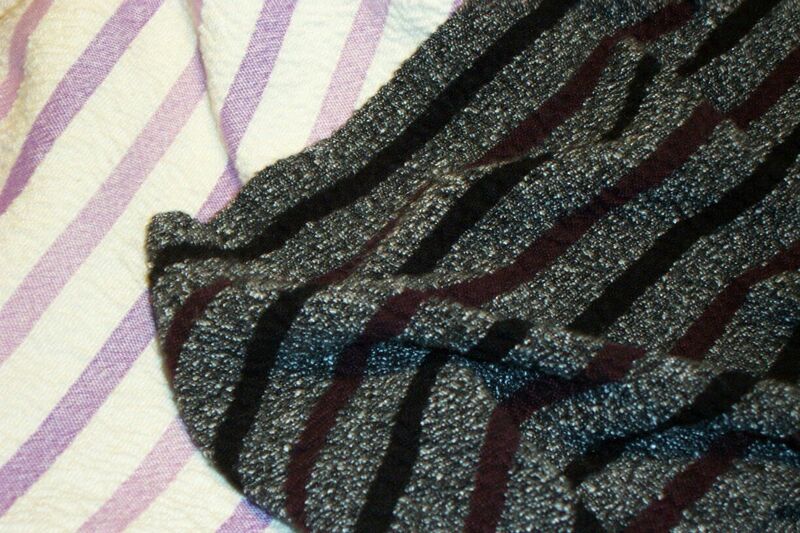 These garments are both woven with silk from Treenway Silks. My background is that I learned to knit age 5 or 6 (so long ago I can't really remember), embroider when I was about 10 (multiple bouts of tonsillitis meant days in bed), sew my own clothing when I was 12. 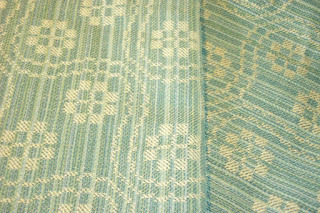 Weaving was just going one step further and weaving the cloth for me to sew with. And yes, I sewed both of those garments. Over the years I have delved into most areas of weaving, but not all. There are whole swathes of the craft I never see myself digging into - for reasons. 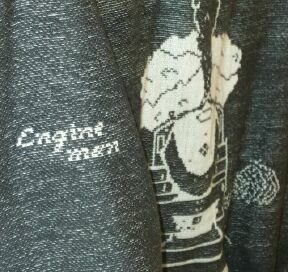 And that is just fine and dandy - no one needs to be an expert on every single aspect of turning thread into cloth. My focus has evolved into developing fashion accessories (scarves/shawls) and household textiles (towels and table napery). That doesn't mean I'm not interested in other types of cloth, and which is why I'm casting longing eyes at the conference schedule. For example, I'd love to attend Abby Franquemont's seminar on Preserving Textile Traditions in the Andes. Maureen Faulkner's seminar Travel and Textiles: Culture, Shopping and Making Souveniers a Part of Your Life sounds intriguing. Partly because I know I'll never get to India or Indonesia as she has done. Fibres on the Wild Side by Sue Perron is going to look at fibre sources from locally sourced plants. Sarah Wroot has studied historical textiles and will use historic fabrics to analyze how they were made. What's the Point of Spinning off the Point by Mary Lessman? I didn't know I needed to know this! I'd especially like to sit in on Dr. Susan Pavel's seminar Weaving Words. She will bring a traditional Salish Loom and share stories, bridging cultures. Heide Kraus is a fount of knowledge about cashmere - I learned more in an hour listening to her and Mary Lessman talk than I ever knew I needed to know. While I know a little about the sashes most commonly known as ceinture fleche', Sue Perron has studied them in detail. I've never steeked, but Elizabeth Schatz will take the Eek out of Steek. Syne Mitchell will look at Etextiles - a marriage of old technology with new. Ack! So many wonderful choices. So much more to learn...I'm going to need another 40 years, I think! One of the down sides of teaching at a conference is that you can't - or don't have the time - to sign up to take anything. One of the down sides to organizing a conference means that you get to choose the seminars and workshops - BUT - you don't have the time to sign up to take anything. There are a number of things I would just love to take at our conference but can't. When we selected the conference teachers and their topics, we first and foremost looked at the talent available in our region. The instructors might not be well known outside of our region, but we wanted to give them a chance to share their knowledge and perhaps become better known. We wanted a range of instructors who could teach a variety of topics or who had specialized in parts of the craft that perhaps weren't very well known. We also looked beyond our region for others who were well known further afield, but who also brought a broad spectrum of knowledge, or filled in gaps in our offerings. We looked for people who were very specialized but also for those who were more general in their approach. 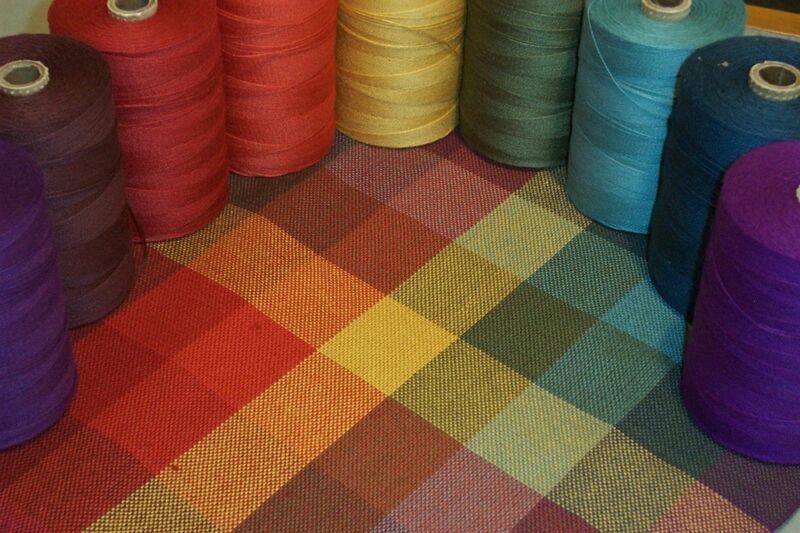 We wanted to cover the spectrum of fibre arts. We didn't manage to cover every single approach to making textiles - we were limited in the number of rooms available to us to book. But I think we did a pretty good job, all in all. Out of the 18 workshops, 4 are spinning, with an additional one that tackles spinning specifically for weaving. So that one kind of bridges spinning and weaving. Six are weaving - one is on a backstrap loom, one is on rigid heddle. One is weaving related because it is about using Fiberworks weaving software. 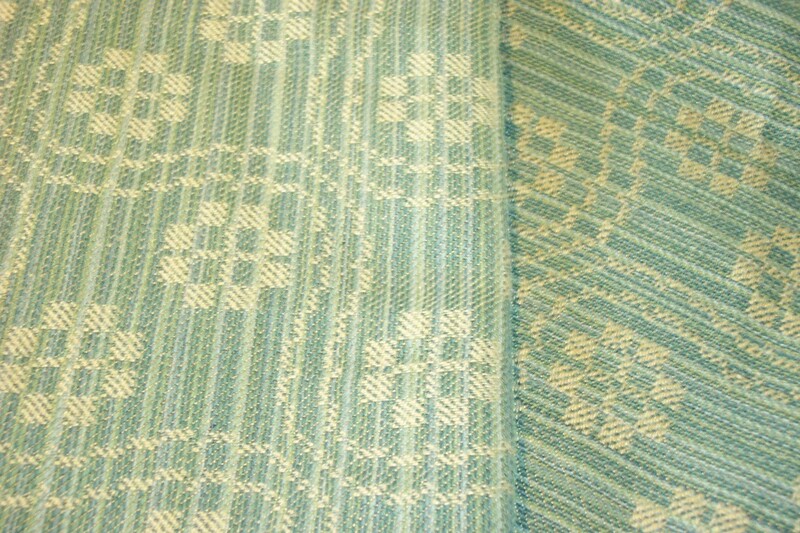 One is working with colour in weaving - again, primarily weaving. One workshop is about nuno felting and one is about shibori - a resist dyeing technique. One workshop will look at dyes from nature, one is about design principles for textiles and we have one Fair Isle knitting workshop. There are any number of seminars I would personally like to take but since I'm also booked to teach, that won't happen. However, I can - and will - have an opportunity to talk to as many teachers as I can track down, maybe at meals or at the social gatherings in the evening. 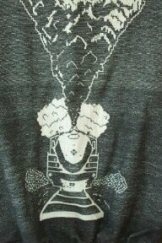 One of the seminars I would really love to attend is Sarah Wroot's where she dissects historic textiles to find out how they were made. The photos above are from the textile collection at Louisbourg when Janet Dawson arranged for us to see what they have tucked away - mainly because they don't have a budget to do anything more than catalogue the textiles they found in the middens. I just wish I didn't live so far away because I'd love to study these textiles. What an honour - to examine them and maybe even give them some information on how they were made. I'm trying to talk one of the students taking the Olds program in NS to maybe consider studying these textiles for their final level. And then I could learn more about the textiles from them. One of my earliest memories is getting my very first library card. I never thought I'd see the day when something I wrote would be in one. Our library is part of the inter-library loan agreement. Which means that if you are interested in seeing the book in real life, you can see if your library will bring this copy to you. Thank you to Wendy who suggested our public library purchase the book for their collection. John Kennedy perhaps put it best here when he talked about going to the moon. There are times when we dream those big dreams and they become a lot bigger in terms of getting them to completion than we had hoped. Or Life Happens and we wind up dealing with stuff that we hadn't expected. We dare to dream, anyway. And we work to make them happen. Take weaving. When we first begin, it may seem like it's a huge big dream to get something usable off the loom. But humans have been playing with fibre and string for thousands of years. Our ancestors needed string to carry parcels. They needed something to keep themselves warm - what better than have an animal donate their fibre to the cause? Because once you've figured out how to make string, you can then take that string and loop or interlace it together to make a textile. Weaving isn't particularly 'easy' - if it was everyone would still be doing it. Weaving is labour intensive. It takes up huge swathes of time. If you also harvest and spin the fibre, it takes even longer. It isn't 'easy' insofar as you get results quickly. But neither is it particularly difficult if you learn how the fibre behaves, how spinning it can modify the characteristics of the fibre, then how to get those yarns to work together as one. We did it for generations upon generations. And we still do it now. If we take the time. If we invest in doing it as well as we can. There are many things in life that are not 'easy'. But they are worth it. When you find your happy place, when you find what makes your heart beat stronger, your curiosity to be engaged? It is worth it. I find designing and creating textiles satisfying and fulfilling. Teaching others means that the craft that I love will continue on, into the next generations. It is why I write. It is why I teach. It is why I have organized conferences. I was 12 years old when Kennedy gave this famous speech. I don't doubt that it was in some way inspiring to me to think about tackling the hard things. To aspire to increase knowledge. 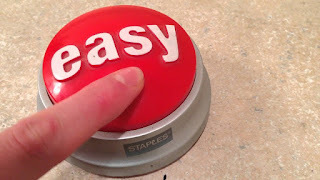 To do something, not because it was easy, but because it was hard. Yes, I have failed at times. But every failure has brought more knowledge. And while I don't like failing, I do recognize that sometimes you need to find out how to not do something. And so - conferences. They are challenging. They are inspiring. They are 'hard' because of all the details. But they are also so much more than the sum of their parts. We are in the dark days of winter winding down. It is February, shortest month of the year. Whoever made it so knew what they were doing! It will very soon be spring and the deadline to register for the ANWG conference here will be coming up very quickly. Take a look at what is being offered. Expand your horizons, or dig deeper into something you would like to know more about. Sign up by clicking on the big blue Register Here button, Then on the Green 'tickets' button. Some things are beginning to fill up. I suggest you sign up sooner rather than later. And come see us in June! After writing about my brother yesterday, I started thinking about the people I admire and respect. They all, in one way or another, dream the big dreams. Some people I have met and am delighted to call friend; others I know by their reputation or their presence in books/magazines, feedback from others, or their on line presence. Some I met because of our shared on line presence, which then led to meeting in real life. I started thinking about our line up for the conference and they all, every one of them, have my admiration and respect. Some are authors (and hopefully will participate in the author signing event - if they aren't too over scheduled/exhausted after teaching for two full days). All are teachers, of course. The teaching model up until recently was in person, either in workshops for guilds or at conferences. Now we have on-line opportunities. Some are out spoken about issues of ethics. All are enthusiastic about teaching, but also about learning. Being open minded, sharing experiences with others. All have dedicated large chunks of their time to the exploration of possibilities in terms of fibres/yarns. We come into this life with a whole lot of potential. I suppose it boils down to my respect for those who have figured out what they really want in life, then worked every hour they could to make that dream come true. You cannot write a book, develop and present an on-line class, create and sell a line (or dozen) of textiles, teach multiple workshops all over the continent, fair weather and foul, without enormous energy being put into making those things happen. Some of our instructors have done not one of those things, but several of them. And generally with good grace and cheer. So I'm going to 'fangirl' a bit and list all the instructors here, again, just to remind everyone of the fabulous event our guild has put together and invite everyone to think about attending the conference in June. So I'm weaving a set of samples and one of them is an advancing twill progression. It's fairly simple, but since it backtracks on itself, I had to put on my dancer hat to work out the choreography of it. In an effort to explain what I do, I came up with this little chart. The numbers are the numbers of the treadles from left to right as we are used to seeing numbers written out. I did this for visual simplicity, so that people could refer to what I'm about to describe. If we take the column of numbers vertically as representing the treadles themselves, then each column is the treadle number from left to right. Each row of numbers is one pick. In this chart, I began upper right with treadle number 8 with the weft traveling from right to left. Each pick then followed: 8, 7, 6, 5. This is the complete 22 pick treadling repeat. To weave this, I begin with treadle #8, and call that pick one. I count through to 22 and by that number I should be back ready to begin the treadling repeat all over again. 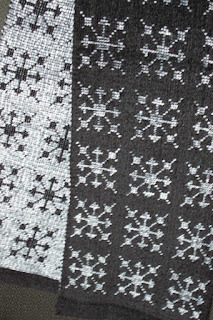 Depending on the weave structure, I may approach it differently - for example Summer and Winter and overshot have two shuttles, one carrying the pattern weft, the other carrying the tabby weft, and the pattern end gets repeated. In those cases, I might just record the pattern pick and indicate how many times the pattern block gets repeated, knowing I must insert tabby. There are many ways to set up a tracking system. Post It notes, file cards, metal sheets and magnets, and now apps. I use iWeaveit, but it works best when the tracking is consistent. In this particular treadling, the runs are not consistent, so I prefer to visualize the 'lines' or 'runs'. If someone can't visualize, then a pick by pick method of tracking is the most accurate way and you can set iWeaveit up to do a line by line tracking in the liftplan mode. Whatever you do, you do have to pay attention, stay in the moment, don't let yourself be distracted. For me, counting to 22 lets me stay literally on track, and if I do get interrupted, I can usually find my way back to a starting point so I can go forward again. It was 11 years ago this month my 'baby' brother sat down and left this earth. It was such a shock when he died. Last night I woke up thinking about him and his birth. You see, when he was born, it was into a tumultuous time for our family. The pregnancy had not been an easy one, then my uncle was killed in a car crash, my aunt in a coma from a severe brain injury, 8 children left behind. And my mother had to pick up the pieces. When Don was born he 'failed to thrive'. So on top of everything else that was going on in her life, mom was faced with an infant who might not make it through the night. It was 1956 and breast feeding was the norm. But every time he fed, it all came back up again. Mom agonized - was something wrong with her milk? With her? She remembered a cousin who died because of 'bad mother's milk'. No such thing, of course, but no one knew why these things happened. So all the available alternatives were tried - cow's milk, goat's milk. Eventually baby formula was tried. When it, too, came up, the doctor advised mom that if Don could keep it down for 20 minutes he had enough nutrition for 2 hours. A schedule of 2 hour feedings with cleaning up after it came up again kept the washing machine chugging. We had a wringer washer and a line outside and mom would get the machine going, the diapers and onesies washed and hung and when I got home from school it was my job to take them all in. During the winter the diapers freeze dried and taking them off the line was an exercise in frozen fingers and a stack of frozen diapers piled high and placed by the wood stove to thaw. Somewhere mom got a 'Jolly Jumper' and after feeding Don, he would get placed into the jumper which was hung in a doorway central to our little house. Mom didn't have to worry about him choking on his own spit up and he seemed to enjoy the gentle action of the swing on the giant 'bungee' cord. His survival became an exercise in perseverance and - ultimately - resilience. He grew up into someone who pretty much rolled with whatever came his way. He was in many ways fearless - but not entirely reckless. Having survived such a risky entrance into life he didn't seem particularly eager to leave by doing dangerous things. But neither did he seem to have much fear. Or, if he did, he did what he wanted to do anyway. He was fair minded, didn't like bullies, stood up for those who needed support. He loved life, was a keen observer of what was happening around him. Enjoyed the outdoors. Respected others who knew more than he did and wasn't afraid to say he didn't know something when he didn't. His dream as a child was to become either a fireman or a railroader. When he wanted to leave school at grade 10 because that was all that was needed to get a job with the railway, the entire family came down on him like a load of bricks - he would not be leaving school until he graduated. He accepted that but not exactly with good grace. Since dad was already in the final throes of multiple myeloma, Don didn't fight it too much, knowing dad was thoroughly against him leaving school. So Don continued with school until he got his diploma. It took him some months, but he got his job with the railroad. It wasn't the 'best' job due to the travel and being posted to other towns for weeks at a time but again, he persevered. He worked his way up until at last he realized his dream of driving the locomotives. He was part of the crew that learned how to drive the big GE electric engines that took the coal out of the mines at Tumbler Ridge, and in the end, drove the last engine out again when they were mothballed. 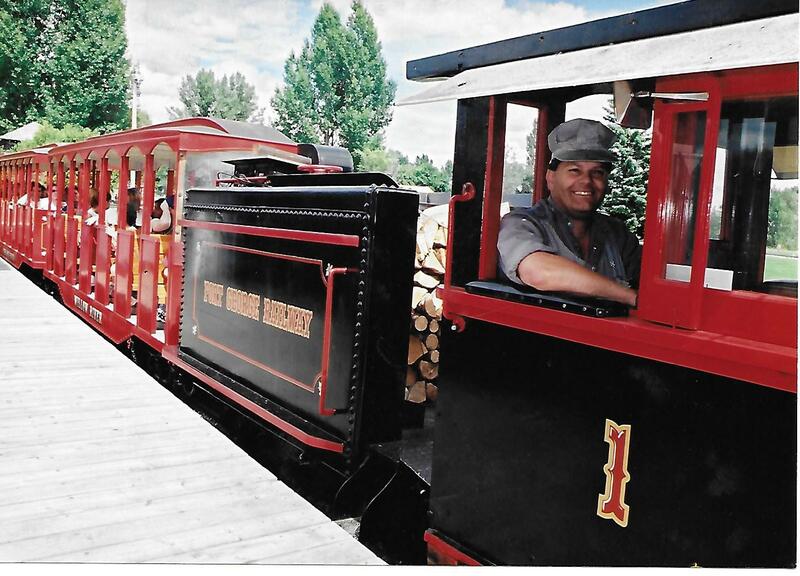 After 27 years with BC Rail, he took retirement and became the park manager for the railway museum. And that was where he died. When I think about my brother, I remember his steadfast desire to be a better person. We often sat and talked about what that meant. I miss those conversations. He challenged me to be a better person as he sought to be one himself. No, he wasn't 'perfect'. He didn't pretend to be. He just wanted to be better. He understood that life is a journey, with ups and downs and adventures along the way. At his memorial, one of his friends called Don a catalyst. I had to agree. Don would come up with an idea, plant the seed, encourage it to grow, celebrate when it happened, expressed appreciation to his friends who helped make it come to fruition. He was also very supportive of me and my weaving. In many ways we were different, but in many ways we are/were the same. And 11 years on? Yes, I still miss him. Gamps can be done in a variety of ways. This warp was painted by Tien in repeating rainbow colours and it will be crossed with different weft colours to show what happens, when. In addition, half of it is threaded in one sequence, then the other half in a different sequence. In order to keep track of what was needed, I counted out 18 heddles on shaft 1 for the first half and when I had filled all of those, I knew that I'd done the first half. Since it was later in the afternoon and I've been dealing with rather more 'tired' than I'd like, it was an easy way to track what I was doing without having to pay a lot of attention. I could kind of zone out and just concentrate on getting the threading sequence correct without thinking about how many repeats I had done - or had yet to do. The second half of the warp was threaded in a more complex sequence so I left that to do when I was feeling more alert today, then printed out the threading draft in a size I could easily read so I didn't have to squint. As I threaded each group of four (or three as the repeat dictated) I tied those in a slip knot and when all the groups in the repeat had been done, I bundled all of them into a larger slip knot. I don't leave the lease sticks in unless I need to adjust the shed geometry of the warp for some reason, so the next step will be to remove the lease sticks and the little box I put under the shafts to lift them higher so I can see the heddles more easily, then sley and lash on. My goal is to begin weaving today to make sure I've got the epi correct. Our days are now noticeably longer than they were 6 weeks ago. We have been having rather cold temperatures but also clear blue skies and brilliant sunshine. On the other hand, I'm pretty much ready for winter to be over! Words matter. The words we say to ourselves - and to others - matter. When I was a child, the playground taunt was 'sticks and stones may break my bones but words will never harm me'. Words do cause harm. Too often we believe the people telling us that we are failures, losers. When we become adults we have had it drummed into our inner most self that if we 'fail' at something, we are a 'loser'. But if there is a loser when we don't get the cloth we were after, who is the winner? No one. No one 'wins' when we don't manage to get the results we desire. We need to re-imagine what is happening and we can do that by changing our inner language. I'm not a huge fan of memes, but I do find short, sharp, pithy comments will sometimes break through to allow people to see the 'truth'. Recently I saw the definition of 'fail' as First Attempt In Learning. Our language seems to have become militarized, with people being 'beaten in their battle with cancer', the person 'fought valiantly but lost their battle with (name disease)'. Life, *learning* isn't a battle. We come. We live. We learn. And then...we die. Dying is not 'losing', it is the natural order of a life. None of us gets out of here alive. We need to change the inner dialogue so many of us live with on a daily basis. We need to open ourselves to new experiences - even when we don't get the results we were after the first or even the 10th time. It is famously said that when Edison was asked how it felt to fail at finding a filament for the light bulb 600 (or so) times, he replied that he had not failed - he had learned how NOT to make a filament. If we let 'failure' determine what we will dream to do, attempt to do, fail at doing, then our horizons will be rather circumscribed. Because every time we try something new, every time we attempt to learn how to do something, we will experience how not to do it. Sometimes several times. Did I let that stop me? No. It was a head-desk moment, especially the second time in a row, but I took it to heart, and remembered. Most of the time we learn best by our 'mistakes'. Sometimes the most valuable lesson is in learning what NOT to do. Every time you find out what not to do, you come closer to finding out the answer for the 'right' way. Or at least in the new circumstance. Because every time you change something? The 'right' answer might change, too. Speaking of language - when you set out to learn a new craft, the very best thing you can do is learn the language of that technology. The one that always puts my teeth on edge is when I see 'dying' when the word the person meant was 'dyeing'. I've seen 'dying' more and more frequently, in publications where the author ought to have known better. I blame auto-correct, but that's what proof reading is for and why authors need to proof read their galley proofs. It's a brake not a break. At least on a loom. The 'reed' (because the splines used to be made from split reed) is made up of 'dents' (the spaces in the reed). The ends per inch (epi) determines density, and is based on so many factors other than just the thickness or wraps per inch of a yarn. Wool comes from a sheep or sometimes other animals although I prefer to specify what that other animal is. Synthetic fibres are made from chemicals, most generally petroleum products. Rayon is not actually 'synthetic' because its chemical make up is cellulose - it behaves like other cellulose fibres and will degrade back into 'dust' unlike synthetics. Pay attention to language. It does matter. **** 'harness' when it comes to drawlooms means a group of shafts, not a single shaft - so you have the ground 'harness' which may be four or five or 10 shafts, then the pattern shafts which may be a harness of 50 shafts - and so on. As I have taught over the years I have come to realize that not everyone can visualize what something will look like...later...after it's been woven. If this is the case, then I strongly recommend people weave samples. Sampling is the only way to know for sure how something will turn out, especially how colours will look after being woven together. I've been learning about colour in weaving for a long time because I wasn't very good at choosing colours to put together to make a pleasing cloth. I studied colour theory. I wound little practice warp wrappings. I dyed yarn. But none of those things reflected - precisely - what happens when you take one colour and cross it with another. Gamps of various colours then became my most effective way to learn how to visualize. One of the big complaints about weaving a colour gamp is the expense. You need to buy a whole cone of yarn for just a little bit of each colour. So for several years I sold colour gamp kits. 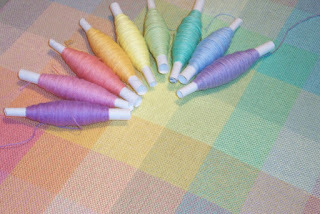 In addition to the more usual primary/rainbow gamp, I offered tertiary, neutral and pastel kits. This allowed people to explore a greater range than they might have been able to do otherwise. For some people they just don't know what is going to happen when they cross purple with, say, a red/brown. Orange with green. Black with yellow. If you've never done it, how would you know? However, if you can't afford to buy all the yarn, you can study what other people have done. For example, you can look at something you really, really like (or dislike - both have lessons) and examine it for what the weaver/designer has done. What colours did they use? In what proportion? In which weave structure? The picture at the top is the next painted warp for Tien's class. I don't know how much she will be able to cram into her suitcase when she comes in June to teach her workshop and seminars on colour at the conference but I'm sure she will bring some. What better way to learn about colour than to actually see - and handle - woven examples that show precisely what happens when weft crosses warp? 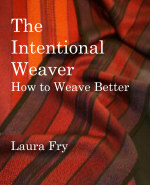 I think one of the things that many weavers have in common is a desire to be in 'control'. We aim for perfection and we are disappointed when we fail - yet again - to be 'perfect'. It was a revelation to me just how much control I needed and how much the craft of weaving allowed me to exercise and even feed that desire for control. I got to choose every thing involved in bringing my vision into material form (pun intended). From choosing the yarn, the colours, how they went together, the process of getting the warp into the loom and the weaving of it, right down to the wet and dry finishing. When I self-published Magic in the Water I not only controlled every facet of the samples, but I also worked closely with a local small press printer who consulted with me on every decision in terms of format, paper choice, etc. It was a massive exercise in controlling All The Things. For The Intentional Weaver I let loose the strings of control somewhat by choosing to go with an on-line publisher who could provide both digital PDF and print-on-demand formats. Not only that - they would accept orders, ship them out, pay me my % at the end of the month. For someone who needed to be in control of All The Things, making this decision was a really difficult one to make. But it was one that I needed to make for so many reasons. One of the things I do still have to do is market the book. It seemed like a good idea to retain control of this aspect because The Intentional Weaver is aimed at a small slice of a small niche market. Who else than me to deal with getting the word out to the target market? That said...if people are purchasing from Blurb? I have no control over their cart. Zero control over their delivery. Zero control over their delivery system of PDF formats. And zero control over their quality control. If someone has purchased from Blurb, then if they have a complaint or an issue? They need to talk to Blurb. If someone has purchased from me during the introductory offer? By all means contact me. For those of you who did buy - either from me directly or from blurb - grateful thanks for your patronage. I really hope that those who invested in the book are finding it useful (some of you have let me know you have, so thank you for the positive feedback). A friend used to say that 'perfect kills good'. I know I've talked about this before but it seems like it needs to be said again. None of us are 'perfect'. Not from lack of trying! It's just that we don't always do things perfectly. We don't always think of the perfect thing to say. We don't always measure up to what we think is perfect. If we get caught up in some sort of dream of perfection, we will quite often be disappointed. Because what we manage to do so seldom ever turns out the way we think it ought to have done. So the ideal of perfection tarnishes what is 'merely' good. But good is...good! There are times when we really need to recognize that while something isn't 'perfect', it is 'good enough'. Over the past little while I've had conversations with several people who want very much to do 'perfect' work. Problem is, that desire for 'perfect' begins to interfere with doing anything at all. When you get caught on the horns of the dilemma of making choices but can't because you can't decide if you are making the 'perfect' decisions...then you can't do anything at all. And you put yourself through the meat grinder of agonizing over what you are going to do - choice A? B? C? Then there's the whole issue of finding that mistakes were made in the set up of the loom. A colour is in the 'wrong' place. Or the wrong colour was used (but is it really wrong? Gah!) My last 'big' mistake was threading the warp that came off the AVL a few weeks ago. 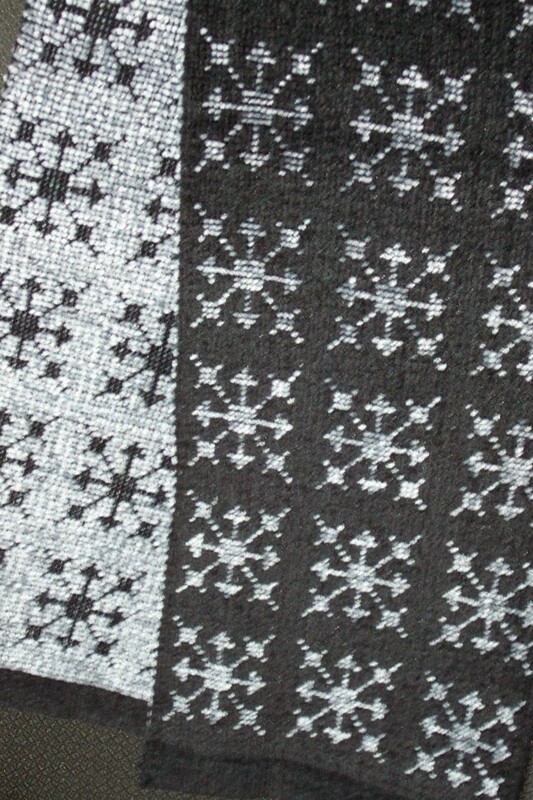 It's an overshot motif that I converted to twill blocks. I wasn't feeling great while I threaded and damn if I didn't make a mistake and instead of one of the blocks being 4 repeats of twill, one of them wound up 3 repeats. I knew I'd made the mistake by the time I finished threading because I had four ends left over and there should have been an exact match of threading draft and threads. It had taken me a couple of weeks with long interruptions before it got completely threaded (Life Happened) and I had little energy to try and figure out where the problem was by going through all 768 warp ends. Instead I chose to sley, tie on and start weaving. If the error had been fairly close to the left hand selvedge I would have sighed, inserted the lease sticks and taken out the threads from the mistake onwards. 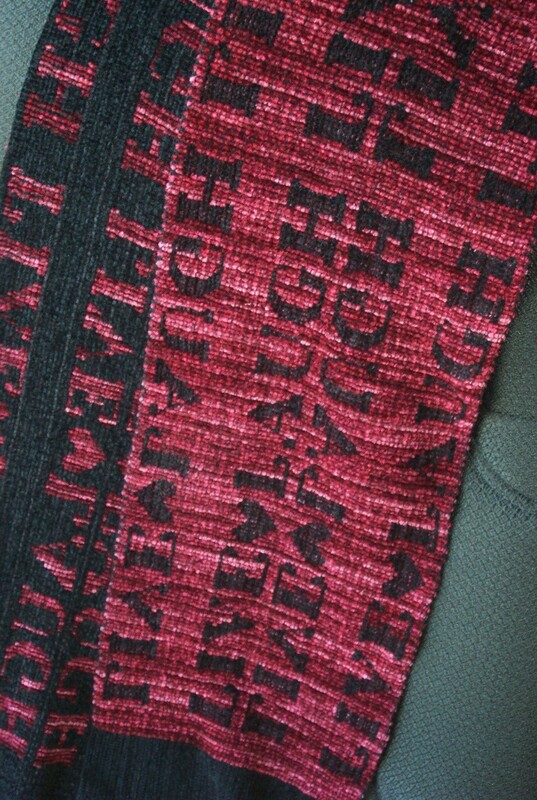 Instead the error was quite close to the right hand selvedge, which would have meant re-threading almost the entire warp. I did not have the heart. Or the energy. Or the mental capacity. So I just started weaving. They were tea towels. Having such an error would not impede the function of the cloth in any way. In point of fact, when I posted a photo on line, most people couldn't see the problem, even when I told them where to look. At that point in time, what I needed was to not beat myself up for being an imperfect human being, but to get into the working meditation, the zen of weaving. Give up the myth of my superhuman powers of never making mistakes. Because I do. I make mistakes. Sometimes I choose to fix them. Sometimes I choose to live with them. I don't claim that making or having mistakes in my cloth is any kind of spiritual practice - other than a nod at my own humanity. I'm just a weaver, trying the best I can to not make mistakes. If such a mistake bothers anyone else, then they must do what they feel necessary. I have chosen - at times - to embrace the entirety of my craft practice, warts (mistakes) and all. I always vow to do better, but sometimes the runner stumbles. One last pithy comment - those who can laugh at themselves will be endlessly entertained. We set out to do something. We do our best, but somewhere along the way, something goes horribly awry. The results are not what we intended. How does this happen? In my life I've found that when I get unintended consequences, one (or several) things have played a factor in the actual results, instead of the one I wanted. Usually it begins with a 'great' idea - but a lack of knowledge. While thinking through this 'great' idea I will have built on the knowledge I possess, but that knowledge may have been incomplete. I may be using a yarn I didn't know intimately. I may have chosen a weave structure I didn't know intimately. I may have assumed that the wet finishing process would be as 'usual'. Because I didn't know the yarn intimately, I may have chosen an inappropriate density. I may have chosen a weave structure that wasn't going to work very well with the yarn at that density. And so on. I may have chosen to use one loom when a different one might have been better suited to what I wanted to do. When I get unintended consequences, it's usually quite apparent where I went wrong. Too late for that particular project or warp, but just in time for the next! Weaving, as I keep saying, can be practiced on a superficial level or deeper. We can follow the directions given by someone else and not worry too much about why the designer made those choices, we're just happy to have had a successful project. And that is perfectly fine. That's pretty much me with knitting. But if you really want to dig into the depths of the craft, there will be times when something goes wrong. The correct response at that point is to sit down and analyse what you did and how it all ended up and figure out why. Sometimes the unintended results are a gateway into a path of exploration that wouldn't have been obvious if it hadn't been for that 'mistake'. 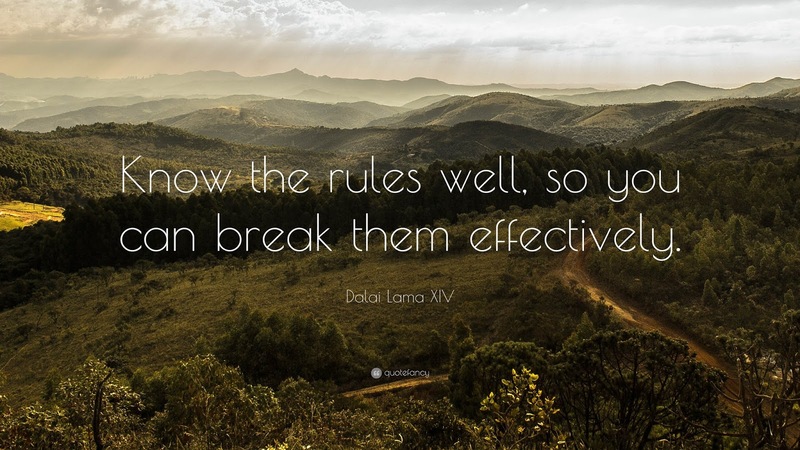 There are even times when I will push the boundaries just so I can see what happens when I bend the 'rules'. And yes, I sample. Every new yarn I get is sampled to find out what it can do, what hidden potential it may have. All of these things bring more knowledge. The more I know, the more I understand how much I don't know. When you don't know what you don't know, you don't know that you don't know it. And that is when those unintended consequences arrive. The only way to really know what the results will be is to invest a little time - and money - and weave some samples. Eventually the pool of knowledge will become an ocean and better decisions can be made. That elusive 'perfect' we all work towards will at least visit, once in a while. But never, ever let 'failure' stop the journey of learning. 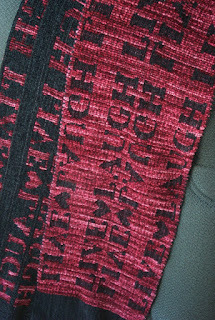 Winding up with a textile that didn't quite express that idea you had? Will not end the world. It's just a textile. And in the course of getting to that result? Knowledge was acquired. Life can be funny, sad, interesting, boring - whatever you want to make of it. Decisions have to be made. Consequences lived with. When I chose weaving as a career in 1975, I had no idea where that decision would lead me. What the consequences - both good and bad - would be. On the whole? It's been a good life. Oh, it's had its challenges, for sure. Things happened, some of which seemed 'bad' at the time, but led to valuable lessons, or incredible opportunities. When I co-chaired the ANWG conference in 1995, I vowed 'never again'! When I self-published Magic in the Water, people asked when my next book would be coming out and I would reply "Not in this lifetime". Here I am, doing both. Again. This time I really do think I can safely say "Never again"! But instead I will say "I can't see myself doing another". I took the decision to no longer teach for guilds last year, nervous about the consequences. Instead of nothing, a couple of opportunities have opened up. I have shared that I am assisting Tien in her on-line class on colour. The kind of assistance I can give is supportive, taking care of things like weaving samples (or digging through my copious samples) for examples. Doing some 'research'. But another opportunity has also recently presented itself. We are still working out the details, but it's local and something I can do at home, not travel. As my body breaks down and becomes more 'fragile' I want to limit the amount of traveling I do. I remain committed to teaching the Olds College master weaving program when I can, plus I have one more distant teaching class in September. But I'm also cutting back on the craft fairs that I do and most likely this year will be the last time I do Calgary. My 2020 calendar is...empty. By now I would be scrambling trying to find teaching dates. Instead I'm breathing, in, out, in, out, knowing that it is perfectly ok for me to NOT be scrambling anymore. Like some other teachers, I am cutting back, stepping aside, making room for newer, younger, more energetic teachers to have a chance, let them take up the torch. For those who find they have the energy to carry on, I say 'brava'! But it's also ok when someone, like me, finds they just don't. Life is a cycle. People come, they go. By and large, it's all good. There is a school of artistic thought that says "There are no rules". I prefer to know what the rules are so that I know how and where and when to bend them. Sometimes even break them. For me rules are all about establishing guidelines. Rules say "if you do this, this and that, the result will be this". Sometimes I want those results; sometimes I don't. Rules also give me a place to start. 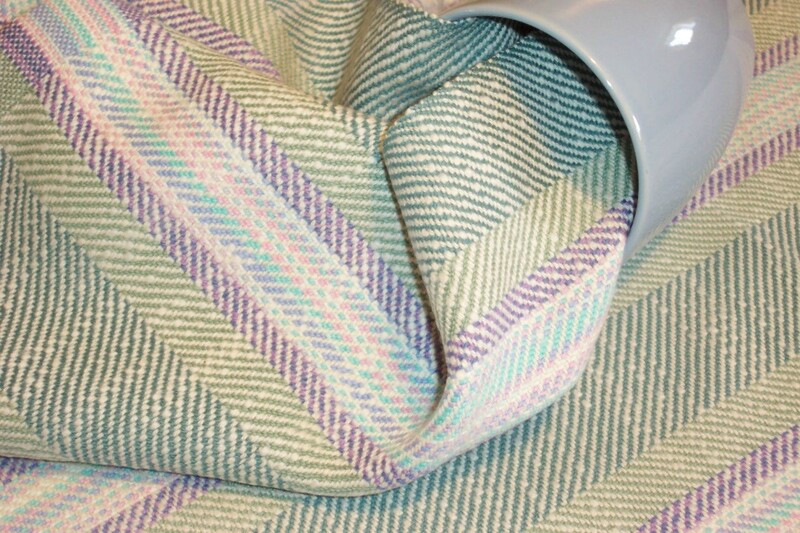 When I first took up weaving I was dismayed at the multitude of possibilities. So much so that it became paralyzing. Where to begin when there are so many options? Just the other day I was talking with someone about creative limitations. Creative limitations are not about curbing creativity, but about finding a path through the morass of possibilities. In terms of textiles, that would be akin to finding the end of the ball of yarn so that you can then use that yarn effectively. After 40+ years of weaving, I can't say that I know everything there is to know, precisely because of that huge pool of potential combinations. So I still take workshops. I still read other peoples books, articles, papers. And I still learn. Now my focus in looking for a workshop is a little more focused than when I was just beginning. At the start, I knew I knew next to nothing, so anything I took was good. Now I know more and my primary intent with taking a workshop is to find out how the presenter thinks. Getting inside their head to look at their thought processes shows me different ways to direct my own thinking. One of the downsides of organizing a conference? I won't be taking anything. I will be far too busy with the organizational details, making sure the instructors have everything they need, then doing the other jobs that need doing. And then presenting seminars my own self. Not everyone can come to ANWG here in Prince George this year, but there are other regional conferences that may be closer - Mid-West, MAFA, NEWS, etc., etc. Having once learned the rules? Go on and bend, twist, break them.